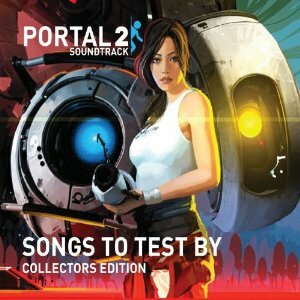 Songs to Test By is the soundtrack for Portal 2. 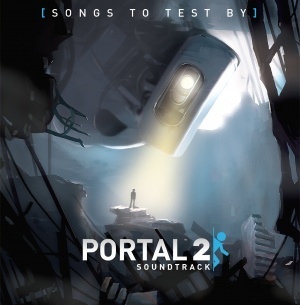 Songs to Test By was made available free from the Portal 2 official website in .mp3 format, and a 4-disk Collectors Edition is available to purchase from Amazon. Shorter versions of particular songs, or sound effects from the game, are available as ringtones from the website above. The soundtrack was released in three volumes: The first, titled Volume 1, was released on May 25, 2011; Volume 2 on July 1, 2011, Volume 3 on Sept. 30, 2011, and as a 4-disk Collectors Edition on October 30, 2012. The Collectors Edition also includes in-game promotional items for Team Fortress 2, and to & in-game promotional items for Dota 2, and the Turret Lullaby comic. Listen to soundtrack on YouTube. There are no downloads because it's a copyrighted disk. Please note that the Trivia section consists purely or mainly of recurring melodies. This section also may be considered as a spoiler for people who would like to listen to the OST themselves. Adrenal Vapor, You Are Not Part of The Control Group, Forwarding The Cause of Science, Robot Waiting Room #6 have a very similar execution and contain a pure sinewave foundation. The second part of 9999999 is actually a remix of Music of the Spheres I. Likely made to reflect on the entire game before, Caroline Deleted contains a snippet from The Courtesy Call at the very beginning, a few lines from Cara Mia Addio! right after that as well as a few looping notes from Music of the Spheres I both as deep and slow and as high-pitched and fast. The song then changes to a remix of Reconstructing More Science, ending on the buzzing noises from Don't Do It. Similarly, I'm Different contains a few tones from Bombs For Throwing at You. They are however hard to recognize, as an extra tone with a different frequency is added right after an original one - only the quiet melody connects it with the other track. Tracks playing in the underground test chambers (You Are Not Part of The Control Group, Robot Waiting Room #1, Forwarding The Cause of Science and The Reunion) are all actually edited versions of the last one, becoming more corrupt with computer errors as time progresses and more of Aperture's story is revealed. This page was last modified on 18 August 2018, at 20:49.